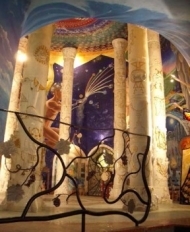 Visitors from the Federation of Damanhur, Italy | Roots and Wings yoga and healing arts, Natick, MA"
This workshop is not HOW to discover past lives, but literally gives you one of YOUR past lives as reflected through the work of the Oracles. Monday there will be private readings using Selfica Symbols. BRAL TALEJ is a new divination system that uses ancestral symbols belonging to a recently rediscovered ancient language. The esoteric tradition believes that it comes from an era preceding the subdivision of languages and that it was the matrix of all other languages. BRAL TALEJ's archetypal signs create a resonance inside each human being, allowing everyone to easily read the message inherent in each card; something not often possible in decks with more arcane symbols to interpret. The exquisite background paintings of Oberto Airaudi, founder of Damanhur's Federation of Communities in Italy, beautifully support the meaning of each magical sign, making the deck into something truly original and mysterious. An explanation booklet in five languages accompanies the 111 cards (each with the magical sign translated in five languages), showing how to use the deck through seven original spreads. Published by VALRA Damanhur. After 33 years dedicated to art, spirituality and teaching conscious awareness in the USA, in 2001 Shama choose to return to her native land to become a Damanhurian Citizen and fully participate in this very interesting social and spiritual adventure. Fascinated and inspired by the Damanhurian Sacred Language she has created 'Bral Talej', a new divination system where the Damanhurian symbols and meanings find a uniquely powerful and beautiful expression. Shama travels throughout Italy, Europe and the USA to present and teach this new deck of 111 cards. Gifted with natural intuition she shares her gift in groups events, courses and individual readings.